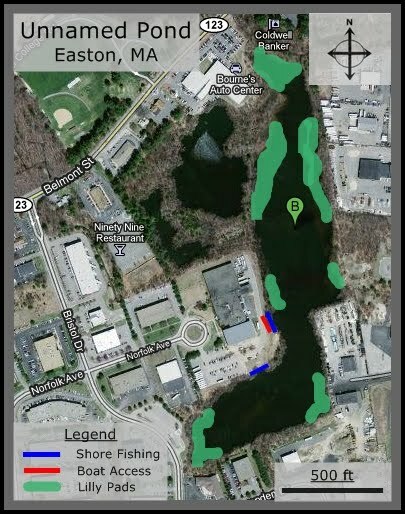 Behind the Easton Industrial Park located on Route 123, you will find a good sized, unnamed pond that me and my friends have had great success in. The pond is well hidden between a couple of industrial parks and has limited shore fishing but if you get a boat out there, you can definitely find some great spots to fish. The only way I know to access this pond is to enter the industrial park by going down Bristol Dr and then taking a left onto Norfolk Ave. This will bring you to a rotary at which you take your first right into a parking lot. Go all the way to the back, left side of the parking lot and you will find a couple of openings to the water. You can usually park right next to the water on the grass or in the parking lot to be safe. There are a good amount of weeds in this pond, especially near the shore by the two openings but it drops off a little bit as you get out further. The space is limited on the shore, maybe room for 4 or 5 people to fish at once so don't expect a lot of different options while you're fishing from the shore. We've always caught a bass or two though working the the middle or even working the overhanging bushes to the left of the openings. If you get a boat out there, which I always prefer, there are 3 spots where I have had the most success in here. The first one is on the eastern shore, directly across from where you put in the boat. It is a little corner where there are some submerged branches and a lot of fish. The next spot, located at the very northern point of the pond, is full of weeds and lilly pads, with a lot of brush overhanging the edges. This is a great spot to throw out a Texas rigged worm or rubber frog and pull in a few bass. The last spot I always make sure to check out is in the southeast corner of the pond. There are several trees hanging very low above the water that give the fish good shade to hide in. Usually, the wind is blowing this direction as well, which push the bait fish that way and you know the bass will always follow them, so expect to catch a few here as well. If you want to explore some more, the southwestern shore always looks like a spot to catch some fish but it is really shallow so just keep that in mind if you have a boat out there. We went here and caught no fish in a canoe. The weeds are scary and you don't want to fall in cuz prolly gators in there . Oh wait, we did catch a sunfish . ..
Great little gem of a spot. The water takes on a very odd color at times, which tells me it's not the cleanest pond around, but it's got plenty of fish.